Last year, I wrote a blog outlining my wishes for my family, and for myself too. My biggest wish of all for the whole family was to go on a holiday as we had never been away together since William was born, nearly 8 years ago. 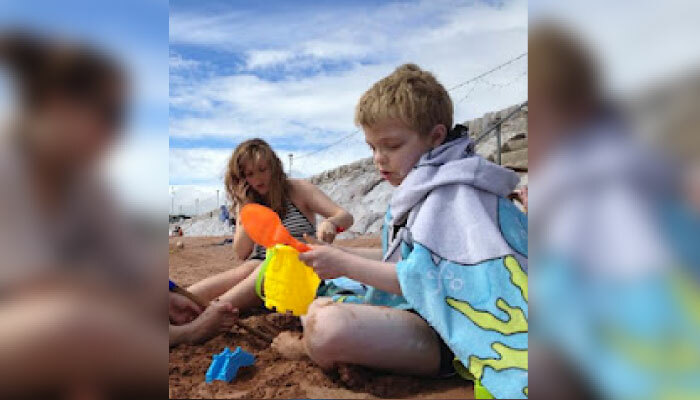 For anyone who doesn’t know William’s story, he was born with a genetic condition (yet to be fully diagnosed – we know he has a protein missing in his cells but the detective work is still ongoing). This led to cerebral palsy in his legs, a form of ‘high functioning autism’, deformed feet and a bowel that didn’t work. Among too many painful procedures to count, and long months in plaster casts, William had a small bowel transplant at the age of four, in 2008 after having spent 80% of the first four years of his life in hospital, resulting in his sisters having to live away from their home and friends with their Grandparents. When a family is that broken apart, things can never be exactly the same again and so any happy times we can share together are not only real treasures but deeply healing. William’s transplant gave William his life and a much better quality of life than we could have dreamed of but he is still dependent on several medications and a feeding tube for 16 hours of the day. He has also had his fair share of setbacks – typically occurring when we least want them, such as throughout summer holidays and the last big set back appearing out of the blue on December 20th resulting in yet another Christmas in hospital. His mid to long term future is very much uncertain. Last week, our dreams came true and we finally got to have a seaside holiday together. Gulls became our friends throughout the holiday and we enjoyed feeding them Cornish pasties on the beach when we had a day in ‘Faith’s Beach Hut’ – the most beautiful hut you could imagine and a place that could so clearly enable us to imagine the child for whose memory it was built for – a pink loving little girl I am sure and one who loved life and was loved by all. Her legacy was alive in every second we spent in her world. We also fed the gulls a little of our ‘Famous Hanbury Fish and Chips’ – although not much because they were the best we’d ever tasted. We were also treated to the best cream tea we’d ever had atAngel’s Tea Rooms. I’ve never been offered such a wide choice of scones! I had no idea what to choose but I think I made the right decision in the white chocolate one – with home made jam and literally lashings of clotted cream. Hmmm! We stayed in the Ashley Court Hotel, as guests of the owners and Wills made good friends with Steve there. We also enjoyed exploring Kent’s Cavern caves, Babbacombe Model Village, Babbacombe Cliff Railway and the Cliff Railway Cafe and Bygones, Victorian street in Babbacombe. Watching the children playing on the beach, hearing William describe the feeling of sand under his feet and the feeling of the waves pulling it back beneath him for the very first time, being relaxed with meals provided (and the washing up done!) so I can fully enjoy my children between William’s treatments, being outside all day and seeing new things all the time and seeing the faces of those who made it possible and how pleased they were we were getting so much from it – all of these memories are unique and priceless. Whatever happens to our family this year, next year or any time now, we’ll have these memories and nothing can take it away, not matter how difficult and traumatic things can be. The wonderful thing about THHN is that many people give what they can – be it a week in their hotel, a fish and chip meal, a cream tea or a free pass to their attraction. Put all this together and a family gets the holiday of a lifetime! This concept has really inspired me. Many families like ours have had to face a huge cut in income due to it being impossible to work full-time and look after a sick child. In these cases, THHN make grants to enable travel to their holiday. I want to add my little bit into the puzzle. Having seen how people can give what they can and, together, give something amazing and this is what we are asking you to do now. If you enjoy reading my blog, please help us to give other families the holiday we have just had by giving up just one ice-cream or extra round of drinks from your holiday or summer day out and donating the money towards a holiday for a family who, right now, can only dream of being able to get away together. You can donate by visiting our just giving page here. Please re-post this and spread the word. Just think how much we could help THHN to give others the magic we’ve had if we, and everyone we know, and everyone they know… gave the price of one drink or ice-cream!